Most New Embroidery businesses start with the SWF E-T1501C, the “C” stands for compact. AT 2.5 feet wide and 5 feet tall the SWF E-T1501C will fit in a home office or any other available space. 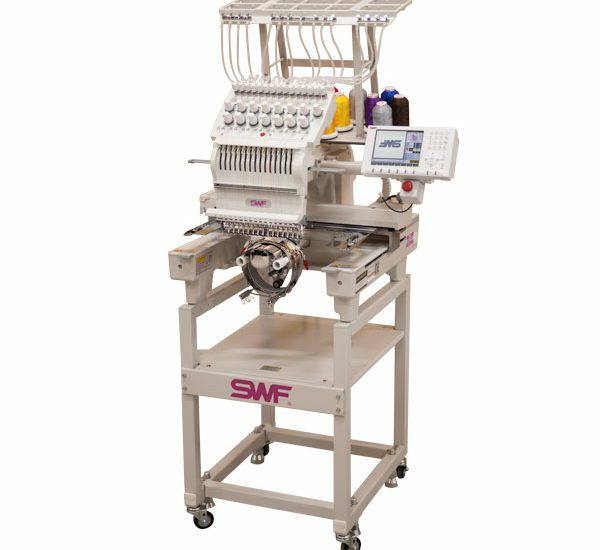 The E-T1501C is a commercial embroidery machine that comes with the SWF Quick Change Cap System which will save time and money. 15 needle, 1200 stitch per minute and only 140 lbs. The small envelope machine still includes the 6.4 inch LCD display and a hardy array of features which are optional on other brands. Backed by a 7 year limited warranty and 3 year electronic warranty, you can buy the SWF E-T1501C with confidence for the future. Origin Return The frame may be returned to the origin point of design during embroidery work. Float Stitch Function Stitch Progressing can be moved forward or backward without embroidery while the frame is set to 1 stitch, 100 stitches, 1000 stitches, 10,000 stitches and color code. Frame Backward When thread is missed or cut, the frame may be moved backward in unit of 1~10 stitches. Automatic Trimming The Auto Thread Trimming Device is automatically operated according to design code and setting and improves productivity as well as the quality of the finished product. Automatic Upper / Lower Thread Break Sensor If upper thread breaks or lower thread is absent, that is sensed to automatically stop the machine. Auto Return to the Embroidery Stop Position After Sudden Power Interruption The frame may be exactly moved to the position at the time of power interruption. This function reduces defects in the finished product. Edit Function of the design The stitch data and code (jump, end, thread trimming) of design may be deleted, modified and inserted. Remaining memory capacity dsiplayed on screen. USB Mass Storage Device Input, output and deletion of designs are possible through the USB memory stick. Function for finding frame center Select the Frame Center Movement Function to automatically return to the origin point and move to the frame center. Frame Semi-Auto Sensor [Hoop Select] Select the desired frame (Square, Round) in the menu, and the frame limit suited to the outline of the frame is set to avoid errors caused by frame interference during subsidiary work or embroidery work. The head and thread tension adjustment plate of the Dual 1×1 Embroidery Machine implements smooth thread way.